de Pando Villarroya, J. L. P. V.; 2006. Sanz Lacorte, J.; 2007. Fernández-Cortés y Fonseca, Javier. José Luís Patricio Vicente de Pando Villarroya, Doctor in Information Sciences by the Complutense University of Madrid, «Historical Sciences, Heraldic Terms», on-line publication, in the domine dictionariesdigitales.net registered on 11th of January of 2006. The release date is taken from Archive.org, checking when this «Heraldic Glossary» appeared for the first time in the record log series. It originally contains 676 heraldic terms without illustrations and 694 definitions. 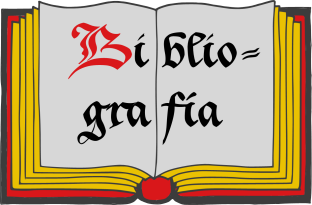 Classification: Dictionary and Castilian language. The author is de Pando Villarroya, José Luís Patricio Vicente. The author at the National Library of Spain. Jesús Sanz Lacorte, «Glosario Heráldico», on-line publication, in the domine armoria.info registered on July of 2004, about 2,650 heraldic terms, more than 2,350 illustrations, 288 pages, estimated size, designed by Bcdreams.com, Barcelona, 28th of May of 2007. 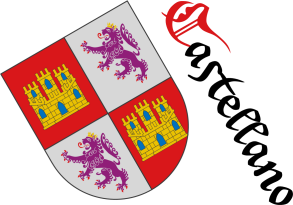 Interpreted coat of arms: with a semi-circular shape; illuminated with metal or and colours azure and gules; outlined with sable; and a freehand finish. Blazon keywords: Quarterly, Azure, Five, Bezant, Bezant and plate, In saltire, Or, Three, Heart, Gules and Ordered. Style keywords: Watercolor, Semi-circular, Illuminated and Outlined in sable. 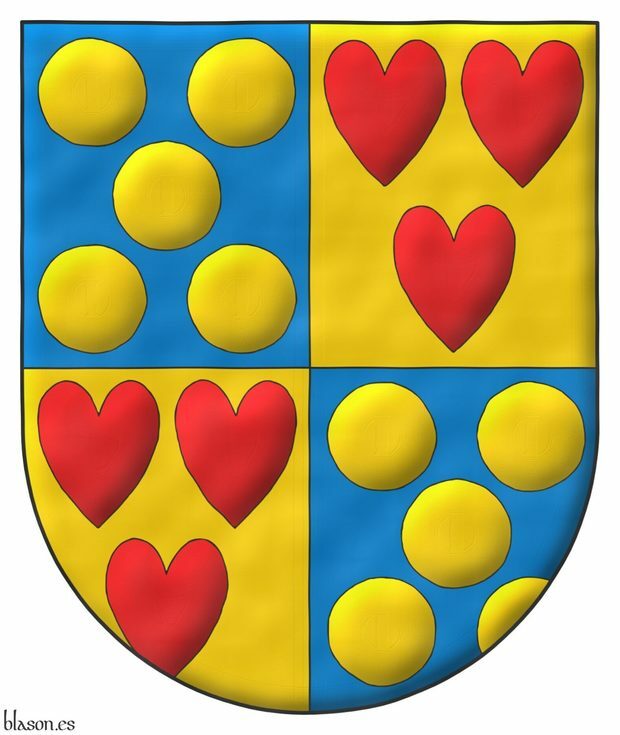 Quarterly: 1 and 4 Azur, five Bezants in saltire; 2 and 3 Or, three hearts Gules ordered. 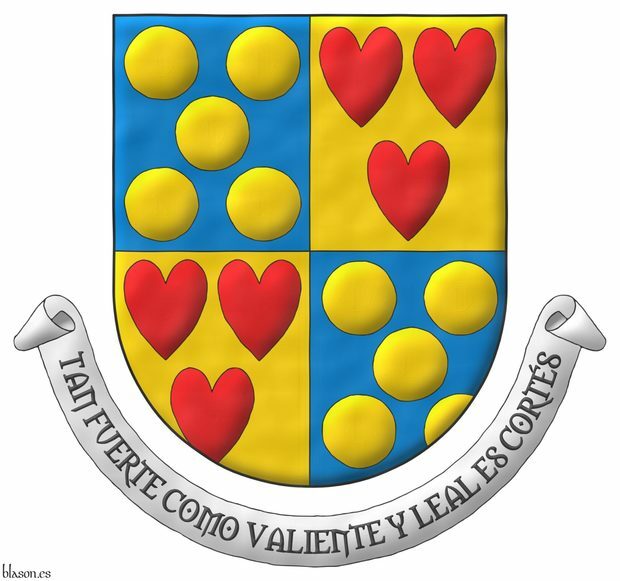 Motto: «Tan fuerte como valiente y leal es Cortés». Blazon keywords: Quarterly, Azure, Five, Bezant, Bezant and plate, In saltire, Or, Three, Heart, Gules, Ordered and Motto (motivation). Quarterly: 1 and 4 Azur, five Bezants in saltire; 2 and 3 Or, three hearts Gules ordered. Crest: Upon a Helm Argent with a Wreath Or and Azure a Lion Or, rampantant, langued and armed Gules. Mantling: Azure doubled Or. 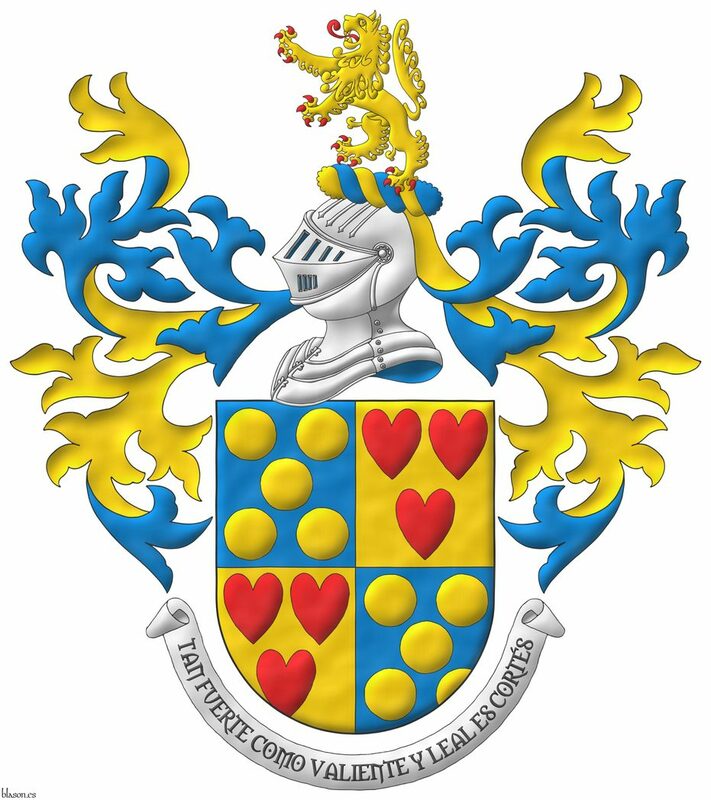 Blazon keywords: Quarterly, Azure, Five, Bezant, Bezant and plate, In saltire, Or, Three, Heart, Gules, Ordered, Crest, Helm, Argent, Mantling, Wreath, Lion, Rampant, Langued and Armed. Quarterly: 1 and 4 Azur, five Bezants in saltire; 2 and 3 Or, three hearts Gules ordered. Crest: Upon a Helm Argent with a Wreath Or and Azure a Lion Or, rampantant, langued and armed Gules. Mantling: Azure doubled Or. Motto: «Tan fuerte como valiente y leal es Cortés». 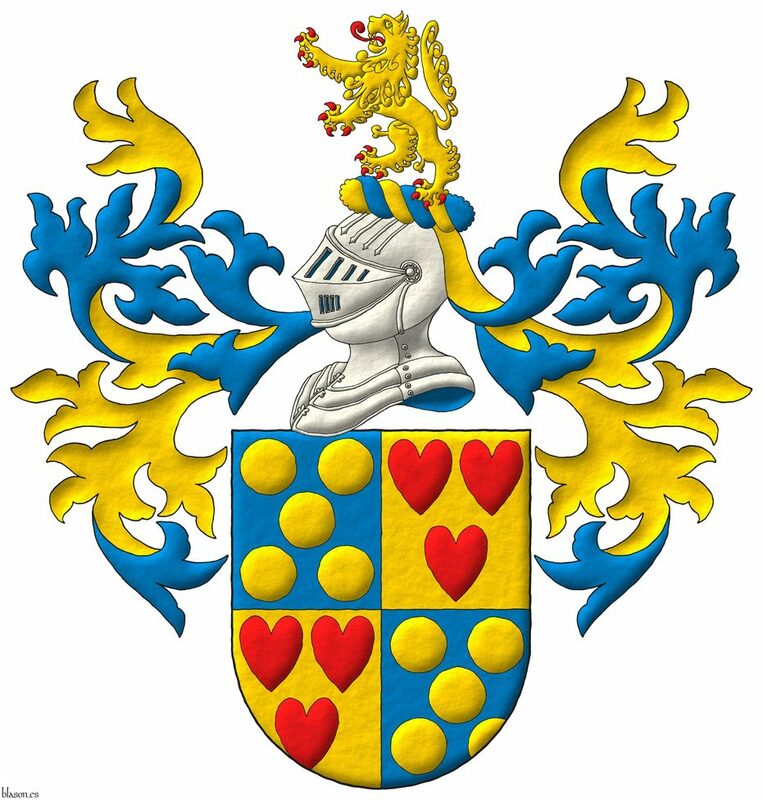 Blazon keywords: Quarterly, Azure, Five, Bezant, Bezant and plate, In saltire, Or, Three, Heart, Gules, Ordered, Crest, Helm, Argent, Mantling, Wreath, Lion, Rampant, Langued, Armed and Motto (motivation). Sigue por: Javier Fernández-Cortés y Fonseca, nobility of Asturias. Watercolor, Armed, Azure, Bezant and plate, Bezant, Bibliography, Wreath, Five, Decoration, Heart, Quarterly, Outlined in sable, Dictionary, In saltire, Coat of arms, Fernández-Cortés y Fonseca, Javier, Personal, Gules, Illuminated, Interpreted, Mantling, Langued, Motto (motivation), Castilian language, Lion, Semi-circular, Ordered, Or, Suspended, Argent, Base, Rampant, Century XXI, Crest, Freehand, Three and Helm.